A generator is one of the most important things you can have in your toolshed. Whether you’re running tools all day long, or using it to power your home, making sure you have one that will work reliably is essential. When it comes to reliability, finding a generator that is up to the task can be a challenge. Virtually every generator on the market is designed for occasional use. Rarely will they actually work to their rated capacity, and running them every single day can often result in generators that fail after just a few short months. The Honda eu7000is is sold as one of the most reliable generators on the market, and consumers regularly rely on them for mission critical applications. If you’re looking for something to store in your shed for a rainy day, the Predator Generators might be a great buy. But if this is a tool that you’ll be using day in and day out, Honda is the only brand to consider. Honda’s affordable suitcase generators can be found dotting construction sites all over the world. But when you need something with a little more kick, you’ll turn to the euro series. These generators are considered to be top of their class. We’ll be taking a look at the eu7000is. We’ll see if this generator can live up to the legendary standard that Honda has set for themselves. [December 6th 2017] – updated the review to clarify the maximum power output from each individual outlet. New information can be found at the end of the article. Despite what the name implies, this generator is rated for a steady output of 5500 watts. It is capable of producing 7000 watts, but only in a peak capacity. This means that it will run things like a 7000 watt fridge, air compressor, or any other device that requires a large amount of cranking amps to start, but the power use falls off as it starts running. For things like heaters, power tools that use motors, or your household electronics, you’ll want to use the 5500-watt rating to estimate your capacity for power. This generator is designed for heavy duty. It can be run virtually every single day without wearing out. 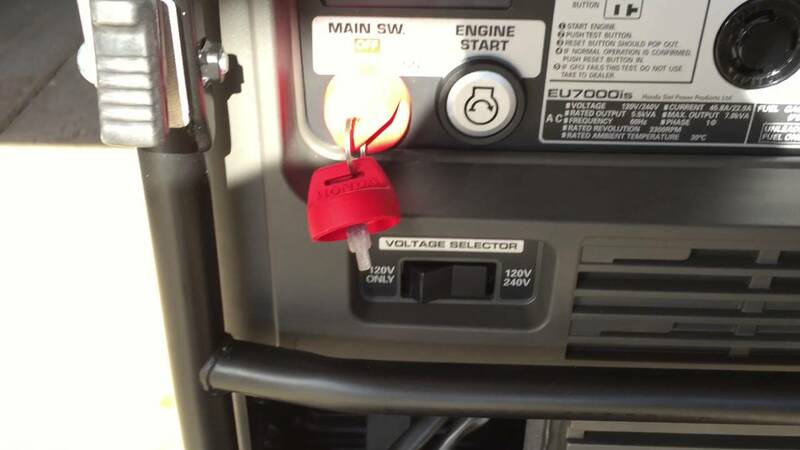 Honda has included several emergency shutoff features that prevent the most common types of damage that can occur when generators are neglected. the Honda eu7000is is designed to be compact, which is surprising considering it’s capacity. They put the controls and case directly over the motor, which makes it a little skinner and a little taller than most generators. We found that it was deceptively heavy given the side. Fortunately, it’s got two-fold down handles and high quality wheels on the bottom. These wheels are fully rubberized, which gives the generator better traction and mobility on tough surfaces. It did take a bit of work, but we had no problem hauling it upstairs or across a gravel driveway. One of the nice things about the handles is that they fold down. This keeps the generator compact when you’re not hauling it around. Generally, we’re not a huge fan of fold down handles as manufacturers tend to cheap out on them. Since this is such a common point of failure, Honda used heavy duty metal brackets. They click firmly into place, and we don’t have any concerns about them wearing out. One of the nice things about the handle is that they are quite large. Since they’re sticking out on most generators, they tend to keep them quite small so the generator remains compact. But with these ones, you’ve got quite a large lever that help you to lift it easily, despite the large weight. The Honda eu7000is keeps all the controls on one easy panel. It’s ideal to have everything on one side like this because you can tuck it into a corner and just leave one panel exposed. If you’re sick on yanking a stubborn ripcord, waiting for your generator to start, you’ll be happy with the Honda eu7000is. It’s got a completely electric starter, so all you have to do is turn the shutoff switch to the “on” position and push the start button. Although our generator was brand new, we found that it started with ease every time. It usually only took a single crank to get it fired up. Just above the starting controls you’ve got a compact LCD display that gives you some information about how the generator is running. You can view the current output, the voltage, the RPM, or the current power use. This is surprisingly handy to have. Even 120V generators can range from 110 to 120V, and often manufacturers power ratings for equipment are incorrect. This lets you know exactly how much of a load you’re putting on the generator, so you can decide whether you can connect more equipment or not. On the right of the generators control panel you’ll find all of the connectivity options. You have two standard 110v plugs, just like you’d use in a house. To the right of them is a separate 110v connector, this one using an GFCI connector. These are locking ground fault disconnect switches. They’re commonly used in explosive environments, or places where you want to protect equipment from ground faults. This is extremely important since generators are not commonly grounded, so these adapters can help to prevent equipment damage and sparks. On the other side you’ll see another similar looking connector. This connector can operate on both 120V and 240V. You swap the power over by flipping the switch on the bottom left. This allows you to run equipment like an electric oven, a freezer, or any other 240v device you have laying around. This generator runs on gas. We’d like to see a dual fuel version, but unfortunately that isn’t something that’s available on the ecofriendly generators as of yet. The benefit to this single fuel system is that the generator can produce a lot of power off very little fuel. The easiest way to improve your economy is to use the eco-throttle switch. This forces the generator to downregulate its fuel consumption. It does drop the power output a lot. In eco mode we were seeing 3500 to 4000 RMS watts. But the fuel consumption was cut in half. This is extremely handy to have when you’re not always using the generator to its maximum potential. We found that we were running it in eco mode almost all of the time. When we needed that extra boost, we could just flip the switch to improve our power output. One of the problems with more inexpensive generators is that the power isn’t always great. Under load, the sine wave of AC power tends to distort. But the Honda eu7000is is capable of producing a very clean sine wave. The total harmonic distortion is a shocking 4%. For reference, the grid power in New York is commonly rated at 6%. This makes it ideal for anyone who’s trying to wire in a backup generator for a home, or run some kind of high end electronics that require a clean sine wave, the Honda eu7000is is a clear winner. Even under load, we noticed that the frequency and voltage of the power rarely dropped. If it wasn’t for the power regulator, we’d suspect that you could get much more than the rated output out of this generator. Most start to crack at around 70% capacity, but even when pushing this generator to the limit we saw consistently high voltages. That being said, when you can push this much power it’s important to make sure everything is connected properly. You’ll want to get a heavy duty extension cord if you have any intention in running this generator near it’s limit. With a cord not rated for the appropriate capacity, you could cause damage to it. The engine itself is mounted on rubber feet, and there is an advanced muffler system that goes well beyond what we’re used to seeing. The end result is that this generator is almost eerily quiet. From a distance of 23 feet, it was almost inaudible. Even when working in close proximity, we found that the noise wasn’t annoying. You’d be able to carry on a standard conversation right next to it, even if it was running at near full capacity. Even if this isn’t an important feature to you, it will certainly be appreciated by bystanders. When abused, any generator can fail. The most common reason for failure is poor oil quality or low oil pressure. This generator has a sensor which is conveniently placed right next to the main inlet. If the oil pressure ever drops beyond an acceptable level, the generator will turn itself off. There are also emergency shutoff sensors for overload and current protection. There are three LED lights on the main panel. If your generator ever shuts off for no reason, the appropriate LED will be illuminated. The chances of you overloading the generator with a single device are slim. Each output is fused at 20 or 30 amps depending on the connector. When you blow a breaker, the generator doesn’t shut off. While the Honda eu7000is still running, you can easily walk over to it and push the breaker back in. The only potentially unfused outlet is the 240V. This one is on a switch. If you like, you can fuse it at 30 amps. But if you’re running your home panel, you can disable this switch and use the main breaker. does this mean that if have the house panel wired for a backup generator I can potentially pull more than 30 amps out of the far right plug on the generator if the switch is in the off position? I must admit that I’m puzzled by the fact that the generator is rated to output 5500W (45.8/22.9A) – but the plugs are only 30A. I have a single backup power inlet plug on my home, and I’d like to maximize the amps going into it (my main panel has a backup 50A outlet leading to a 120A breaker). I’d appreciate any help you can give me – and thanks again for the fantastic write up! How Much Power Can Each Outlet Put Out? You are correct in your calculations, and the total sustained output of the generator is 45.8 Amps at 120V. However, the actual output available at each socket is limited by two things: the position of the voltage selector switch, and the total rating of the socket. Even though the outlet is tapped into a circuit with 45.8 amps available, the outlet itself is only rated for 30. Power draw exceeding 30 amps CAN damage the outlet. This is why Honda installed fuses on these sockets. so why the heck would Honda use 30 amp outlets when the generator can output more than that? Two reasons: they did it for compatibility, and they did it because it’s the law. In north america, electrical code REQUIRES that specific plugs be used for specific applications. What plug you use is determined by the voltage, current, and wiring. Keep in mind that NEMA (North American Electrical Manufacturers Association) REQUIRES that locking (twist) outlets be used for higher current. This is because generators can vibrate, and having a high-current plug slip out during operation can be quite dangerous. This is why the lower 20A plugs in the center of the generator look identical to the ones you have in your home, but the higher amperage plugs are the locking type. 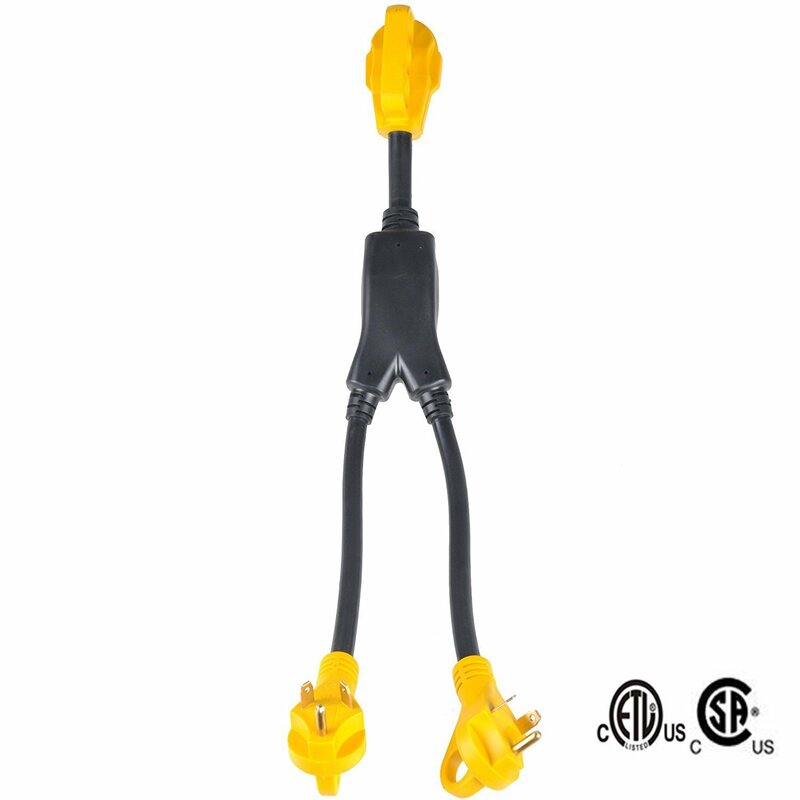 Outlet #1 is a L5-30R – rated for 30A at 120V, with 2-pole 3-wire grounding. This is the 120V only plug. Outlet #4a is an L14-30R – rated for 30A at 120 or 240V, with 3-pole 4-wire grounding. In 240V mode, it supplies the full rated output of the generator. But in 120V mode (#4b), the 3rd pole is disabled, which brings it down to the same rating as the L5-30R – 120V at 30 Amps. We said it was “potentially” unfused because that depends on the position of the switch. We should have been a little more clear about this, but technically it’s always fused at 30 amps. When the voltage selection switch is in 120V mode, the outlet is tapped into the full power of the generator, but the 30 amp fuse will prevent you from ever reaching full output. But when you’re in 240 volt mode, the maximum sustained output of the generator is 22.9 amps. (22.9 amps x 240 volts = 5500 watts) It’s technically STILL fused at 30 amps, but you’ll never trip that fuse at 240V because you will overload the generator BEFORE you hit the fuses rating of 30 amps. So when in 240 volt mode, you need to place an appropriate fuse (25 amps is suitable, as the generator has a surge capacity of 29 amps at 240V) in your breaker panel. So to answer your question: no, you will never be able to pull more than 30 amps out of any single outlet on this generator. The built in fuses prevent this in 120V only mode, and in 240V mode the maximum sustained output of the generator is only 22.9 amps. 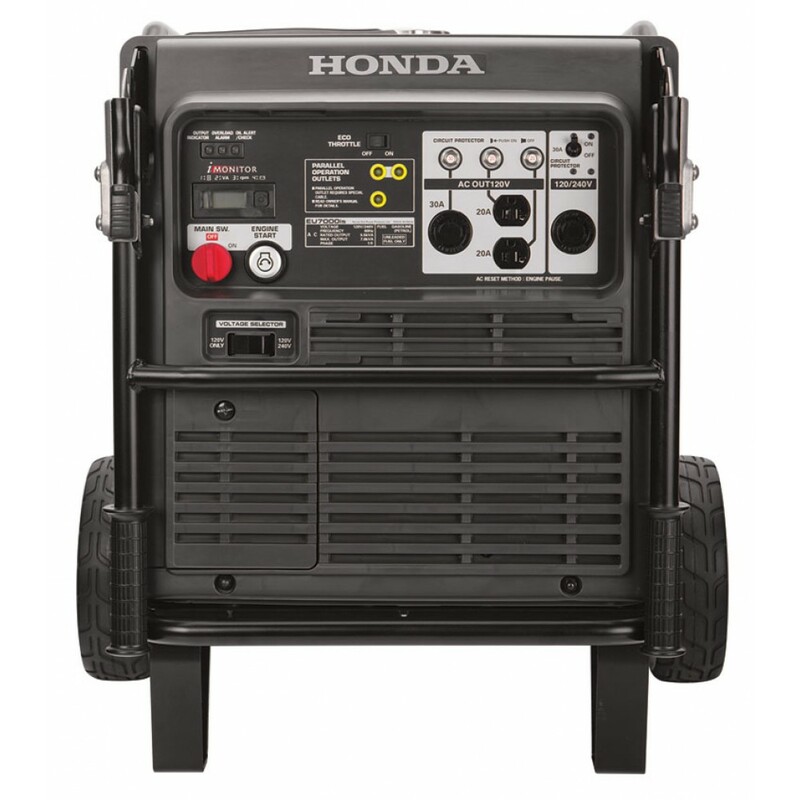 Why the heck didn’t Honda just put a 50 amp outlet on the generator in the first place? If you refer to the NEMA outlet chart I posted earlier, you’ll notice that the only locking connector rated for 50 amps requires 3 pole / 4 wire grounding wiring. With the EU7000is, the third pole is disabled in 120V mode. Based on the way the generator is wired, there is no way to use that plug and there is no approved outlet for 50 amps across 2 poles. In theory, Honda COULD have changed this wiring and included the outlet. But the two locking connectors they did use are industry standard, and replacing either of them likely would have hurt their sales. this parallels the two locking 30amp adapters into a single 50 amp RV connector. You can then get an extension cable with the 50 amp connection on the end, and wire the other side into your home. You can also build your own, but there are a couple things to note about this link. 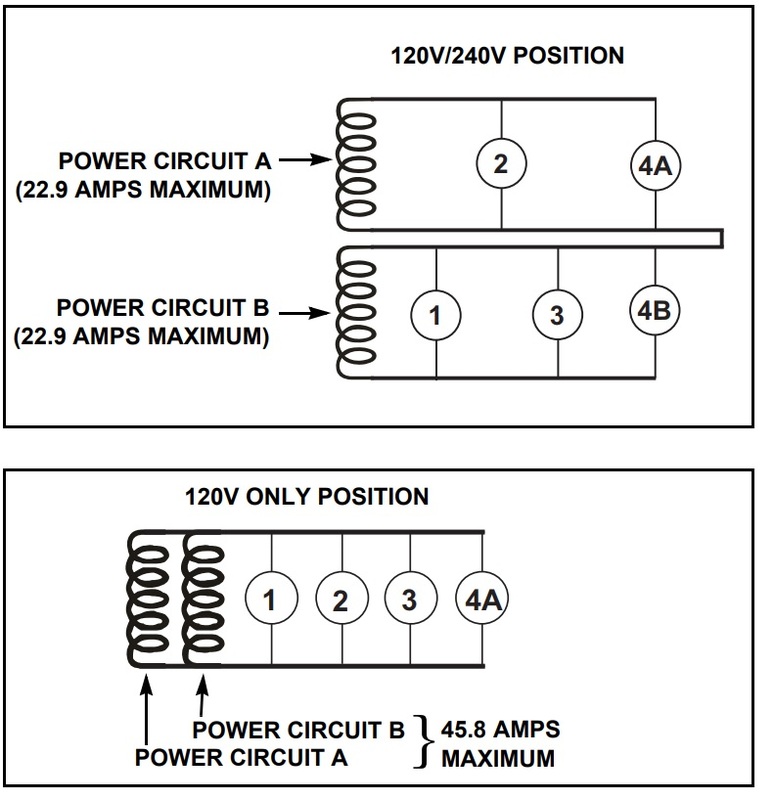 – This guide is for a kit that combines two 2000W generators into a single 30 amp outlet. 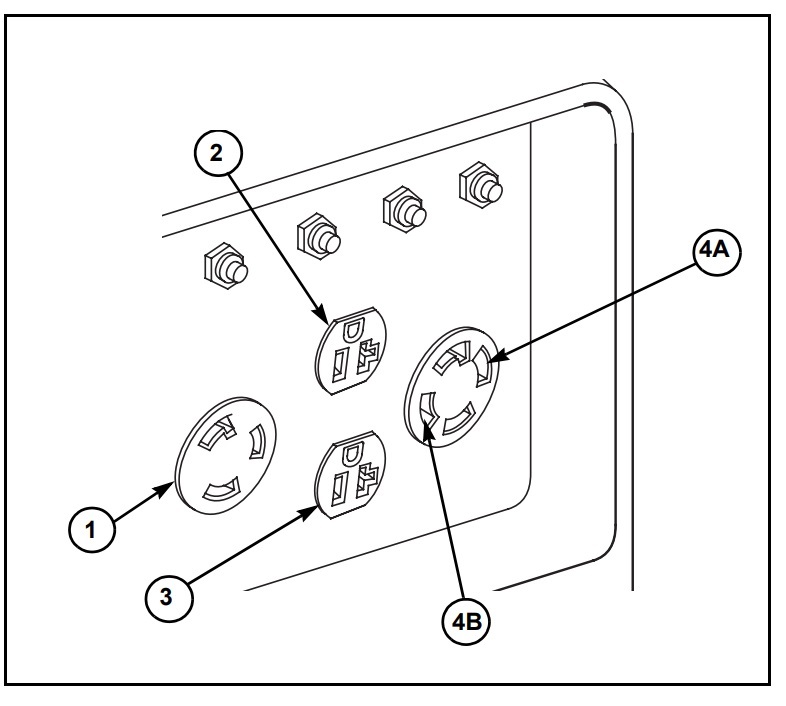 – you MUST replace the 30amp outlet with an appropriate 50A outlet. Just to clarify, do NOT follow the instructions of that guide to a tee. If you’re comfortable modifying the directions for use on the EU7000is, fly at er. Eventually we’ll write a more detailed guide, but we have a little more research to do first. Paralleling generators has a few different applications. Most commonly, it’s used to combine the outputs of two smaller generators. But it’s also used on a larger generator like this to get around the single circuit limitations such as the ones on the EU7000is. A bad thing about Honda EU7000i is when a surge shuts down the generator output and the generator is still running (doing nothing). How about a wireless unit that alerts the user to thus? This is correct. When you blow a fuse, all power output on that outlet is ceased. However, the generator continues to run and burns up gas. If you don’t keep a watchful eye, this could cause problems for people using the generator to charge batteries or other background tasks. You can get a remote starting kit for the Honda EU7000is, but this doesn’t alert you if the generator shuts down. For now, this is just something to keep in mind if you think that you’ll be exceeding the limits. 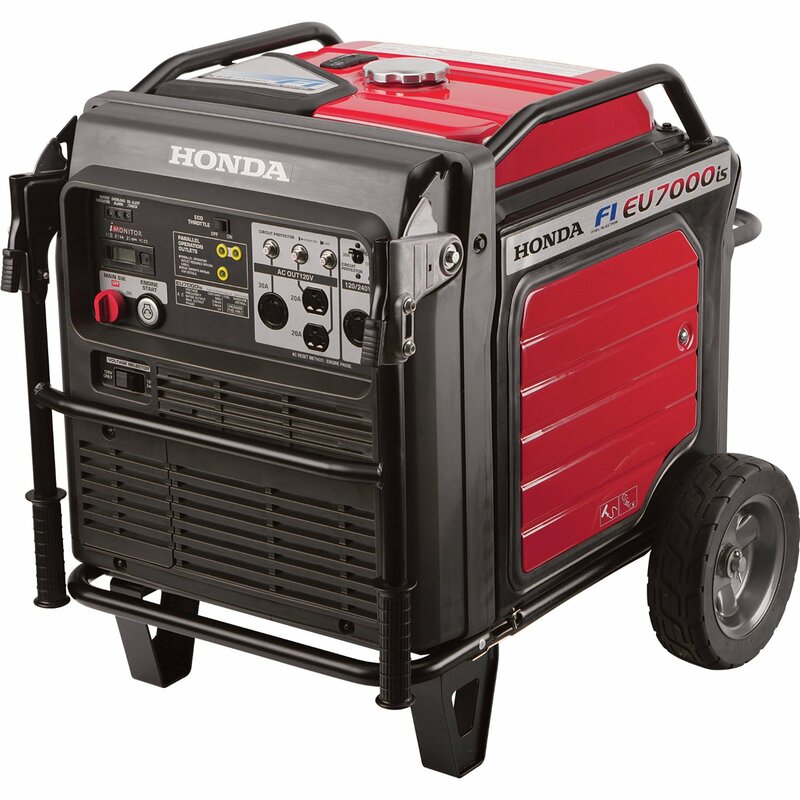 If you can afford it, the Honda eu7000is is one of the best generators on the market. It’s got world class reliability, whisper quiet operation, an easy to use control panel, and enough power to run an entire house. If you find that you’re running a generator all the time, it’s extreme durability and impressive fuel economy will save you enough money that it will more than pay for itself in the long run. That being said, this generator isn’t for everyone. If you’re only looking for something suitable for occasional use, you can save a lot of money by going with something like the predator generator. Those models are much cheaper, and unless you are running it regularly you won’t see much use from the Honda. 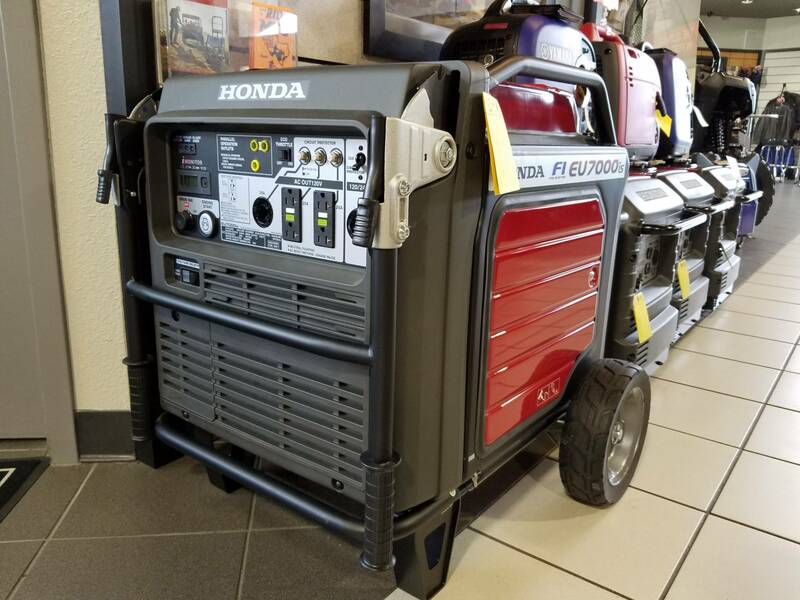 But for those of you that rely on a generator, the Honda eu7000is is the latest version in a long lineup of high quality generators for consumers who demand the best.